Music and the Arts are an important part of learning that takes place at Our Savior Lutheran School. Creative expression is a gift from God designed to enrich and beautify our lives, as well as bring glory to His name. 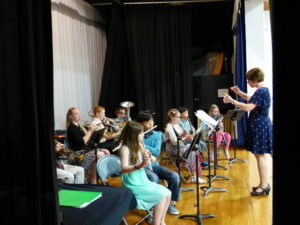 Students in grades 3-8 may take private instrument instruction. Students are required to rent or own their instruments. Lesson time is scheduled during the school day and therefore, students may have slightly more homework to make up in the evenings. Students must maintain an overall C average to participate. Participation in the school chime choir is available to 5th through 8th graders. Practices are during the school day. The chime choir plays in chapel and during special services. Eighth grade students will be given priority in joining chimes due to the limited number of members in the group. Participation in the school choir is available to 5th through 8th graders. Practices are during the school day. The choir sings in chapel and during special services. God has given us the gift of expression through dramatic arts. 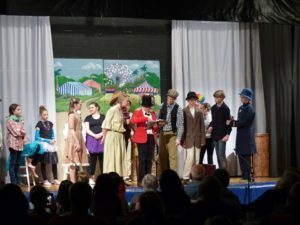 At Our Savior Lutheran School, we encourage the expressive use of drama through the presentation of several plays throughout the year. 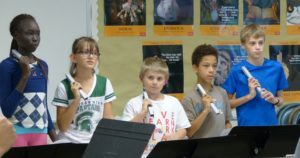 Students in Kindergarten through fourth grade prepare a musical and fifth through eighth grade students prepare and present spring plays. Lessons are provided for a fee by a certified piano teacher. Students usually earn high marks in local piano competitions and do well in the annual Spring recital. These lessons are available for students in grades 4-8. Lessons will be scheduled during the day with class schedules in mind for the best time for the student. Students must maintain a “C” average to participate in this activity.